Propulsion: two pressurized water cooled reactors powering two steam turbines with two five bladed fixed pitched shrouded propellers. K-64 was a Russian designation shared by the first Alfa Class Submarine and later by a Delta IV class submarine. The K-64 Designation was first given to the first Alfa Class Submarine, laid down on June 2, 1968 and launched on April 22, 1969. In 1972, the submarine suffered a major reactor problem in the form of a leak of liquid metal coolant. The superheated metal solidified on contact with the colder outside air, freezing and damaging internal components of the reactor. She was removed from service and towed to Severodvinsk. At the dockyard, the damage to the reactor was deemed too extensive for repair and the decision was made to salvage as much as they could. K-64 was split in half, its bow section (including control spaces) was taken to Leningrad and used for training new Soviet submariners. 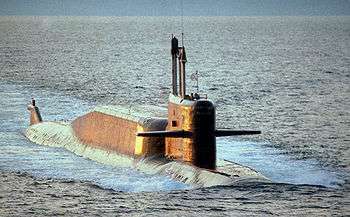 The K-64 designation was again given to a Delta IV class submarine launched on February 2, 1986 as the fourth ship of its class, entered in service in the Russian Northern Fleet. The sub was laid down in December 1982 and was built at Sevmash plant in Severodvinsk. This ship is still in active service.